The message "Windows cannot open this file" is always displayed when a user tries to execute a file with a file extension unknown to Windows (meaning that it is not associated with any program installed on the system). Windows is giving you the option to search the Internet for clues on how to handle that file then or pick a software from the list of installed applications of this computer. I never - and I really mean never - experienced a successful search when using the Internet search.It is completely useless in my opinion and I made the decision to never use it again a long time ago. I decided to get rid of it completely and auto-select the option to pick a program from the list of installed applications instead whenever the message comes up. Instead of relying on Microsoft's search that is clearly broken, I'd either try and use a program already installed on the system, or if that is not working, use a search on the Internet to find an appropriate program fro the file extensions. The Registry needs to be edited to change this behavior. I'm sure some of you know a software that can do it but as always, I prefer to do things manually whenever possible as it provides me with reassurance that nothing else is changed on the system. Press Windows-R, enter regedit in the Run window and hit enter. Please note that you may get an UAC prompt on newer versions of Windows. Create a new Dword with the name InternetOpenWith. Close the Registry afterwards and test it by renaming a file extension to an unknown one. You will witness that the option to search the Internet will not be shown anymore for unknown file extensions. The Open With dialog window will be shown instead instantly. Update: the message has been modified slightly in newer versions of Windows. It now reads Windows can't open this file. 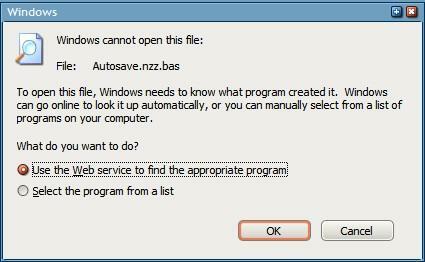 The following text is displayed underneath: To open this file, Windows needs to know what program created it. Windows can go online to look it up automatically, or you can manually select from a list of programs on your computer. The web search is unfortunately still unable to identify the majority of unknown file types which means that bypassing the dialog completely is still the best idea to go forward. Find out how to bypass Web Search whenever you try to open a file in Windows that has no program associated with it. man, i really wanted this to work. did you possibly leave out something in the dword config, martin? Archer no everything is like it worked on my system. Did you create a Dword and name it InternetOpenWith ? The value is 0 by default as it should be. and create the Dword InternetOpenWith. Again the default value should be 0 for the newly created key. If it is set to another value change it to 0. Try rebooting the computer as well, maybe that helps ? works like a charm, martin. martin’s the man, people. please disregard my previous comments. Then I could use it next time I install Windows. Awesome !! Works like it should .. Thanks for the tip, now I finally got rid of a very annoying feature. this didnt work for me at all… i got “cant open file… ” whatever i typed on the list. It cant even open the “regedit” either.. my computer must have BIG issues I even tried this in safe mode… any other help please?? Did someone have success with Windows Vista (Enterprise)? It does not work with my machine… Any other suggestions? oh my god! it works! at last the stupid dialog its gone! ive been looking for this for a long time! thank you! thank you! thank you! one less annoyance to have to worry about! thank you again! really useful!